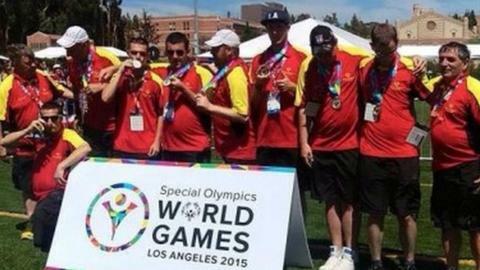 A spokesman said the "football team saved their best until last"
The Isle of Man men's football team have won gold at the Special Olympics World Summer Games. The five-a-side team beat Slovenia 1-0 in the final to secure the Isle of Man's third gold of the Games held in Los Angeles in the United States. The Isle of Man's other gold medals were won by gymnast Paul Clucas on the floor and bocce player Nicola Wooldridge. Clucas also won silver on the rings, bars and overall bronze. A team spokesman said it has been an "amazing set of performances" with the football team saving "their best until last." He added: "Paul was incredible in all his gymnastic disciplines. He is a real star." Kaye Keigwin has been at the Games with daughter Emily, who won . "It has been so exciting", she said. "The footballers were playing in temperatures reaching 40 degrees which is an incredible achievement for them. "There have been so many brilliant performances with medals and personal bests galore." In total the Isle of Man team won 22 medals - three gold, eight silver and 11 bronze. The Isle of Man has sent its to compete in the event, featured about 7,000 competitors from 165 countries. Manx athletes will take part in eights sports including football, swimming, bocce and cycling. The Isle of Man team won 25 medals at the last Summer Games in Athens in 2011. The team will arrive back at Ronaldsway airport at 10:00 BST on Tuesday.